From Northwest to Southeast, D.C.’s public murals help tell the story of black history. Take a look at our gallery below, showcasing some of these public artworks. Notable figures depicted in the murals include: Carter G. Woodson, considered “the father of black history;” activist and leader Malcolm X; abolitionist and writer Frederick Douglass; and poet Langston Hughes. Some of the murals are funded by the District government, while others are privately-commissioned. There are also a few that are quite new, while others will soon disappear due to development. The gallery presents a snapshot of D.C. murals relating to black history, so feel free to post photos of other such murals in the comments section. 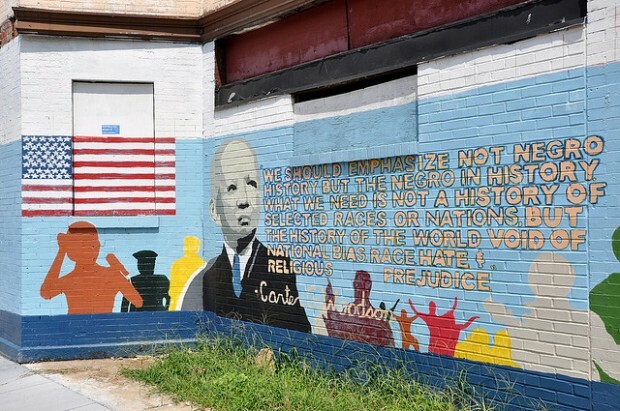 This mural on 7th Street NW in Shaw depicts historian Carter G. Woodson, considered the "father of black history." Woodson lived in D.C. 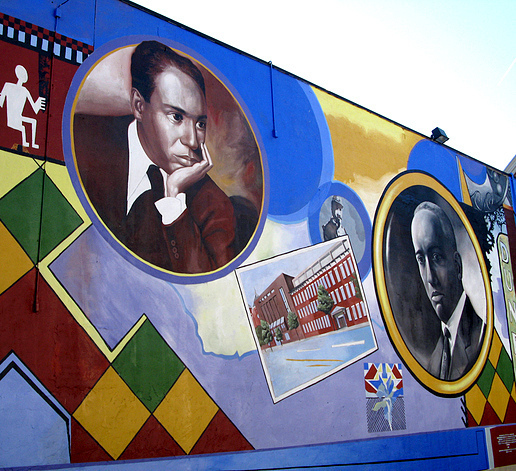 Poet Langston Hughes and historian Carter G. Woodson, both once Shaw residents, are depicted in the Shaw Community Mural on 9th Street NW. The Shiloh Baptist Church is also shown in the mural, a black church that played an important role in Shaw's community life. Frederick Douglass is the centerpiece of this mural on Bread for the City's building on Good Hope Road SE. Douglass lived in a home nearby. Malcolm X is included in a mural on the building housed by Sankofa Cafe and Bookstore on Georgia Ave NW. 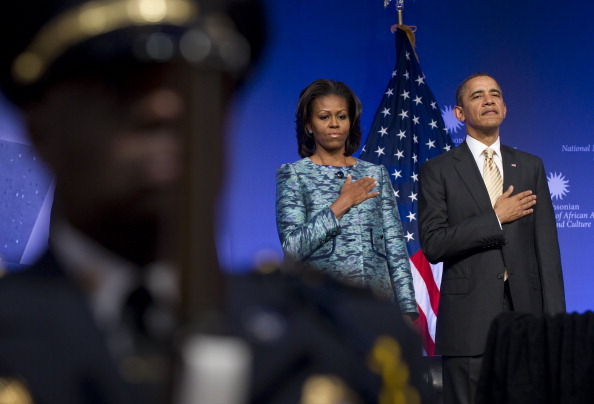 The image comes from a famous poster that shows Malcolm X wiedling a rifle and looking outside of a window, underneath the words "By any means necessary." This relatively new mural off of U Street NW includes imagery evoking the 1963 March on Washington, which was originally called "March on Washington for Jobs and Freedom." Duke Ellington is one of Washington's native sons. This mural on U Street NW was originally near the U Street Metro Station but was dismantled and moved a few blocks down to the True Reformer Building. This Duke Ellington mural was just completed in late 2011, and was painted on a building on Ward Place NW near where the jazz legend was born. This mural off of New York Avenue NE pays homage to some of D.C.'s great music legends, including Marvin Gaye. The Black Family Reunion mural shows a collage of an anonymous family through the years. 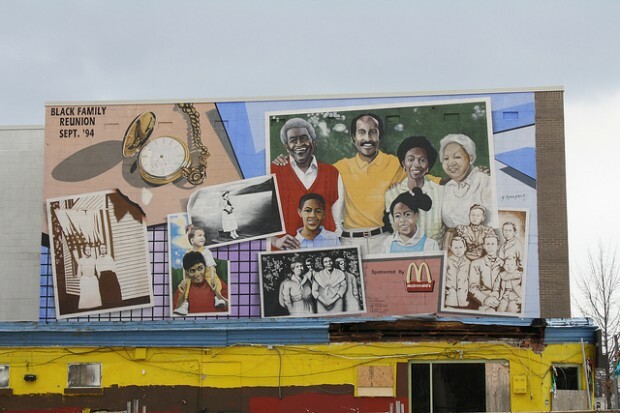 Originally commissioned by the National Black McDonald's Operators Association, the 18-year-old mural on 14th Street NW will soon be replaced by development.